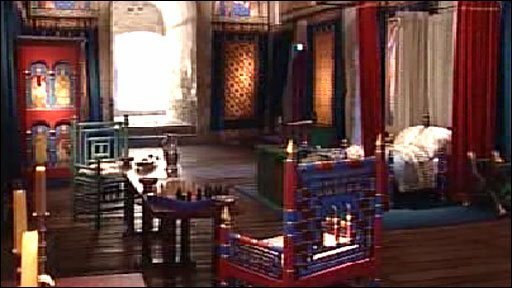 The opulent interiors of King Henry II's Dover Castle have been recreated by English Heritage in a £2.45m project lasting two years. The Kent castle's Great Tower has been brought back to life with almost psychedelic colour and drama, its restorers said. It reopens on Saturday. It follows extensive research by a team of historians who worked closely with artists and craftspeople. English Heritage said the castle had been a palace of "Versace-esque bling". It is thought that King Henry II built the Great Tower to assert his power at a time when the shrine to Thomas Becket at Canterbury was becoming increasingly popular, and Dover had become an important focus for pilgrimage. The Archbishop was murdered by followers of the king in 1170. Following Becket's death, the French king Louis VII made a pilgrimage to Canterbury in 1179. Soon after his visit, and apparently embarrased by the lack of ceremonial facilities for the French king's massive entourage, Henry II began construction of the Great Tower. Dr Edward Impey, who directed the project, said: "The cult of St Thomas Becket was a big issue for Henry, and he wanted foreign pilgrims to be greeted with an in-your-face symbol of his own wealth and power." Historian and professor John Gillingham said the recreation of the Great Tower would show visitors how Henry was "eager to impress his audience amid the rise of a religious, some say anti-monarchical cult". Researchers have said fresh examination of Henry II's accounts suggests "a spending frenzy of Elton John proportions". 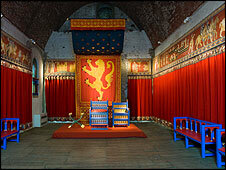 The tower's interior has been transformed to give visitors a sense of how it would have looked. The king's hall, king's chamber, guest hall, guest chamber, privy kitchen and armoury have been furnished to evoke their original appearance. 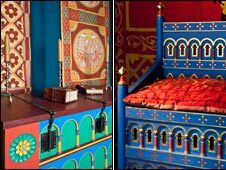 People who thought the Middle Ages were drab and grey will be astonished by the tower's opulence, and richly-furnished and shockingly-coloured chambers, English Heritage said. Light projections of moving figures, costumed re-enactors and audio-visual technology are being used to add to the sense of stepping back in time. During the two-year project, 140 artists and craftsmen have made 80 pieces of furniture, 21 oak doors, 459 feet (140m) of wall hangings, dozens of embroidered textiles, 47 cushions and more than 1,000 objects. To mark the reopening, light projections will transform the structure and dazzle the night sky on Saturday. The scheme was funded by a government project to drive regeneration in seaside towns and was supplemented by English Heritage.